From the highest quality medical research grade magnetic therapeutics to detailed information and magnetic research protocols, we've been proudly serving health professionals and the public worldwide on the internet for over 18 years. Like most folks, you may think magnet therapy is just for pain relief. But did you know that this gentle non-invasive side-effect free therapy also has the potential to prevent, manage, or even reverse disease? This is something that few people are aware of, and Arizona Unipole Magnetics is proud to be among the few companies that actually provide information about the Importance of Polarity when using magnetic therapy to encourage healing. All of our products are designed to deliver only the beneficial Negative/North Pole magnetic field of energy to the body. The fine Polar Power magnetic therapeutics that we sell are backed by over 23 years of FDA qualified research documented by William H. Philpott, M.D. The late DR Philpott is still widely recognized today as the worlds leading authority on magnet therapy today. All of the fine Polar Power magnetic therapy products used in Dr Philpotts' research, and all of his 40 Magnetic Health Quarterly research reports with detailed prescribed protocols are available for purchase on our website. We accept PayPal ~ The Safest Way To Pay Online! Polar Power© doctor research tested and approved magnetic therapy products are the gold standard in the industry today, and come with a 30 Day Customer Satisfaction Guarantee. These are the same premium magnetic therapeutics that William H. Philpott, M.D. had prescribed in his research protocols to reverse many major medical conditions. In his 23 years of dedicated work on the FDA qualified Magnetic Resonance Therapeutic Research Project Doctor Philpott wrote 40 "Magnetic Health Quarterly" research reports documenting case histories, observations, and the actual protocols that were used in his clinical research for reversing particular medical conditions. The late Dr. Philpott is still widely recognized as the worlds leading authority on magnetic therapy today, and his extensive research has not been surpassed. His magnetic therapy research reports are ideal for the self-help enthusiast. We're here to help you get the right magnets the first time. The free magnetic therapy information available on our website can help you to make a well informed decision about which magnetic therapy products are right for you, and how to get the best results using them. We highly recommend you take advantage of this information before purchasing any magnets for application to the body. The Negative (North Pole) and Positive (South pole) magnetic energy of magnets have been shown in clinical and laboratory research to have completely opposite effects on living biological systems. The Negative/North Pole magnetic field has been shown to normalize metabolic function and encourage healing, The Positive/South Pole magnetic field has been shown to over-stimulate and disrupt metabolic function. Please see Importance of Polarity for important detailed information regarding biomagnets and their effects to biological systems. We don't sell any bi-pole or quadra-pole products, and we don't recommend their use for magnetic therapy applications because we believe that a mixed positive/negative magnetic field could actually be harmful. 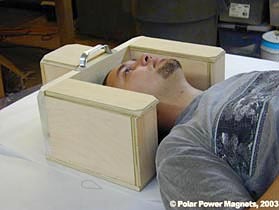 All Polar Power© magnet therapy products are designed to apply only the beneficial Negative (North Pole) magnetic field to the body, and are clearly labeled so you'll always know you're applying the correct polarity when using our superb Polar Power© biomagnetic therapeutics. Persons with pacemaker or any electrical device implant, pregnant women, or woman who are nursing should not use therapy magnets without proper medical supervision. Arizona Unipole Magnetics makes no claims that magnetic therapy or magnetic therapeutics cure, heal or prevent disease. All information that we provide on this website is for educational use only and is not to be construed as medical advice. Therapeutic magnets are currently classified by the FDA as "benign" and "not essentially harmful". Arizona Unipole Magnetics believes that prolonged exposure to bipolar magnets or the positive magnetic field may be harmful to biological systems and should not be applied to the animals or humans. To date there are no known adverse side effects associated with the use of Negative Field (North Pole) magnetic therapy. POLAR POWER© magnetic therapy products for a happier healthier life!